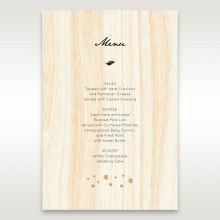 Exceptionally unique and captivating, this woodland themed invite simply oozes with natural inspired elements. A forest like scenery is captured in the textured laser cut cover with a wood pattern design of the tri-fold insert card serving as the backdrop. 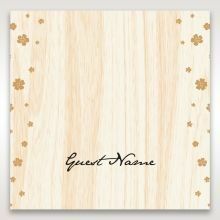 Gold foil stamped flowers combined with your names printed in luxurious raised ink adds elegance to this creation. 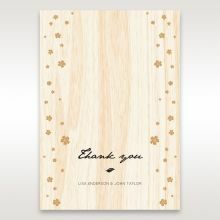 The wooden plank style on the front of the card flows throughout the design when opened, offering a relaxing rustic vibe that balances well with the sophisticated typography. The verse wording is customisable to include your own love verse or other wedding information. Great designs and quick shipping! Pricing and ordering process are straightforward and super easy.I had a sample of this delivered and it really is exactly the same as the pictures! i couldn't believe what type of quality you got for such a good price. 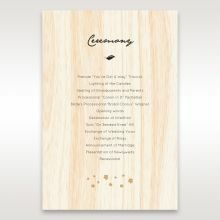 I will definitely order my invitations through this company and I am sure all of my guests will love them too!!! Would definitely recommend to anyone in doubt. Order a sample if you are not sure and see for yourself! Thank you. Now I am off to order some more goodies from Giant Invitations! I really love this design! It's unique and so beautiful! I think it would be great for a wedding that will be held in a venue with lots of nature like trees and flowers around. The streaks of brown on the paper inside the invitation cover gives me that impression of a tree trunk. The golden colour flower prints looks really nice on it. Thank you Giant Invitations for this awesome design! Your other designs are great too, but this one really stood out for me. The whole process has just been so quick and smooth! From the start, I was impressed by the number of designs they have – from classic to elegant to “overboard”, they seem to have a design that suits everyone. It was especially nice to be able to go through the whole design process all online as well. The designers were very responsive and the modifications reflect my desire accurately. The quality of the paper and printing are also excellent.Overall, I think the price was very reasonable in light of the quality product and service I was getting! I would definitely use Giant again! 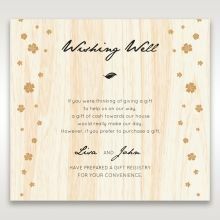 I knew this invite was the one when my fiance picked it straight out of the selections I presented him to look over… what a relief!We ordered a sample and arrived within 2 days in a lovely case with a complimentary RSVP card sample. The product exceeded our expectations and matched the description perfectly.The card is made of good quality paper and the laser-cutting is perfect with no shabby or rough shapes.It ticked all of the boxes for the bride, the groom and the mother so we definitely have a winner! Absolutely love my invitations, amazing design and great quality paper. The order was processed very quickly and arrived fast. Staff were extremely friendly to deal with. Only critic is the writing for poem is quite small so for people with bad eye site it is very hard to read but I still absolutely love them. There were no surprises when they arrived and looked exactly like the photo depicted. This invitation absolutely exceeded our expectations! Thank you so much for your honestly and transparency. 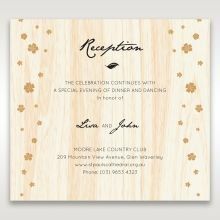 I will definitely order my invitations through this company and I am sure all of my guests will love them too!!! Would definitely recommend to anyone in doubt. Order a sample if you are not sure and see for yourself! Thank you. Now I am off to order some more goodies from Giant Invitations! I absolutely love these invites! 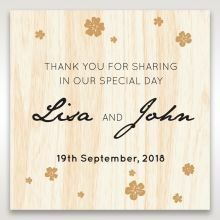 I received so many compliments by my guests saying how elegant the invites looked and what a unique design. I found the company very, very easy to deal with as they offered excellent communication and customer service. The prices were also very reasonable, was expecting to pay much more for such nice invites! Will definitely be using Giant Invitations again for my next event! Beautiful card, I'm very happy with my selection, this card is delicate and classy, the printing is well done and the quality is excellent, staff was very helpful too, The shipping was on time and the package was protected, I have ordered the invitations, save the date, rsvp and the menu cards. I love the quality of the envelopes they look so cute with our address on, I highly recommend this site. We ordered a few samples, and this design caught our eye immediately, the details looked so intricate and the detailing was what we were looking for. When the samples arrived, they looked even better in reality, the paper was beautiful to touch, and the raised lettering was something special. We are so happy that we found Giant invitations! Will definitely be ordering from here for our invitations! This was such an amazing find on the internet. Ordered the sample to inspect after seeing this invitation and was so happily surprised at the quality. I’ve had another look and ordered more samples due to their large range of choices. So pleased with the quality and service! Will most definitely be making my invitation purchases from them. Was also so surprised that they offer great value for your money. Well worth a look and order some samples, you’ll be delighted when they show up! We ordered a few samples and this is definitely our favourite with the lovely golden flowers and raised ink prints which made it look very nice and fancy. This is also the only card amongst the six samples we ordered that does not say the country of origin at the back of the card, which is great as we do not want "Made in China" printed at the back of the wedding invites. I had a sample of this delivered and it really is exactly the same as the pictures! i couldn't believe what type of quality you got for such a good price. I used them for my wedding invites and a number of people commented on how delicate and beautiful the invitations were. We wanted to created the right first impression and i definitely felt after i saw these invites that that was exactly what we had done! This invitation is definitely one of my favourite ones! There are just too many invitations to pick from! The gold flowers on the outside of this stands out so much and is just beautiful. I like that the paper invitation inside is detachable. 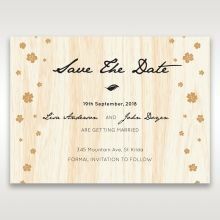 The matching RSVP and save the dates are really gorgeous as well. The quality of these invitations are really great considering the cost is so minimal. A really great invitation!! This would have to be my absolute favourite - there are just too many beautiful designs to pick! And when you thought it couldn't get even better then upon visiting the actual store my fiancee and i were blown away by the sheer quality of Giant's range. The customer service is yet another fantastic aspect of this business. You know you've made the right choice when you stop worrying about your invites. Giant Invitations made finding and ordering an invitation easy and stress free!! With so many different options; from card styles, to wording and fonts, ect... Being able to order samples so you are 100% sure with your choice is a brilliant idea. 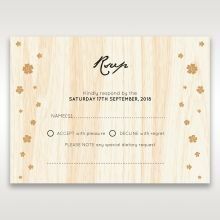 Plus all the matching extras are available IF you want them.I think the invitations are great value for the detail they are; you couldn't make these at home for that! We ordered a sample and absolutely love it! Will definitely be ordering these for our wedding! 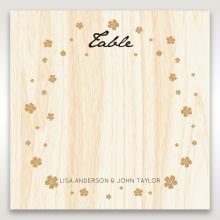 We ordered this sample and will be ordering for our invites. simple and elegant and Suits our outdoor style wedding. We ordered a sample of these for our wedding and we absolutely love it. 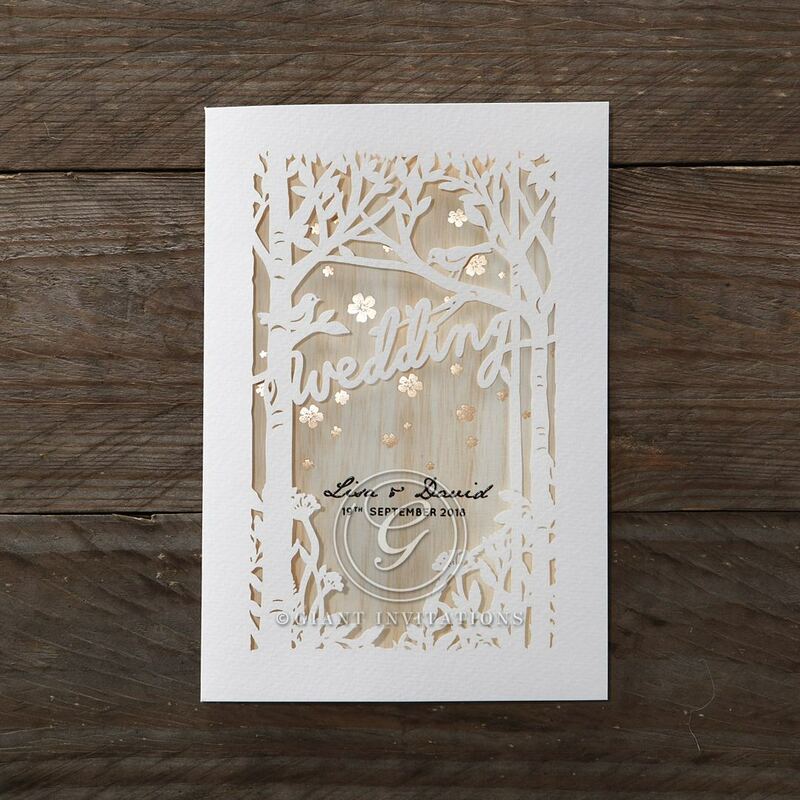 The paper matches the tree theme so well and the gold foils give it the finishing touches to make it a beautiful wedding invitation. Beautiful Products ! 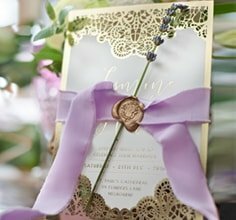 Best I have seen yet..
Lovely laser cut invitation that gives an extra special element by having the gold flowers that almost seem hand foiled. Very impressed, will be ordering these for my wedding. We ordered a sample of these and they were absolutely lovely. Perfect for our wedding theme. We ordered these samples and loved them. The textured paper with gold flowers really caught our eye. Very, very happy with our invites. It's elegant without being too girly. 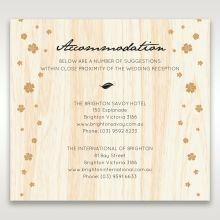 We ordered the full invitation package and our guests absolutely love them too. Unique card with ample space for wording without looking too cluttered. We love the front cutout and the metallic gold flowers add that extra special touch. Out of all the samples we ordered this was our favourite, we loved the wood grain paper and how everything fits in together. We would like to be able to choose a different colour outer card but other than that we love it! High quality paper and very neat. Great attention to details. I would highly recommend them! Easy to navigate website and beautiful designs! There's so many fabulous products it's too hard to choose!